Who now controls enterprises’ technology-driven innovation? With global companies collaborating ever-more closely with their customers – co-producing goods and services or sharing supply chains that extend across different territories – who now controls enterprises’ technology-driven innovation? Is IT the lynchpin of enterprise innovation strategies or is it increasingly shared with different lines of business or ‘outsourced’ to internal functions like security or networking? Is the CIO the orchestrator or just a facilitator, playing second fiddle to powerful lines of business or global technology vendors? Technology is driven from the ‘top-down’ - aligned with a company board or CIO’s vision - or by lines of business or specialist departments? Notions of IT governance are being replaced by multiple approaches to technology strategy or partnerships? Does the CIO lead enterprises’ efforts at technology-driven innovation in the enterprise - or is the process more complex and nuanced than that? Through independent researcher Sapio Market Research, Teneo questioned both US and UK-based organisations, around one in five of which (22 per cent) has a turnover of £30 billion or more; the majority (68 per cent) having a turnover of between £750 million-£30 billion; and 10 per cent having a turnover of between £100 - £750 million. Each survey respondent operates an average of 400 sites world-wide. IT is certainly regarded as omnipotent in enterprises’ ability to innovate and invent. Large majorities of interviewees – typically in the high eighties per cent and above – say that technology innovation is crucial to modern enterprises’ ability to meet their customers’ business needs, pursue innovation across their enterprise, and drive revenues, respectively. Moreover, nearly two thirds of CIOs (64 per cent) interviewed say they concentrate on resolving their customer issues, highlighting the importance of purposeful innovation in boosting the customer experience, co-production and process transformation. Company boards, backed by CIOs’ know-how, often set the broad direction of travel but responses show that joint co-operations are becoming the key component for IT Vice Presidents (VPs) driving business innovation, ensuring that customer needs and business outcomes are met. Interviewees recognise a growing interplay between the board, CIO, specialist departments and corporate business units when pursuing technology-driven change in a global enterprise. Whilst almost half of CIOs (48 per cent) questioned says they want to lead on innovation, almost as many want to play a collaborative role in it (43 per cent). Joint approaches to innovation are on the rise, with collaborative strategies now used by 41 per cent of CIOs - against only 30 per cent saying they were doing so two years ago. Leaving aside IT strategy, (which 54 per cent of our interviewees say is ‘top down’ in nature against 32 per cent saying it is collaborative), survey responses suggest much higher levels of collaboration elsewhere in the enterprise invention process, as seen in IT implementation: (31 per cent ‘top-down’ against 48 per cent collaborative), cloud migration (29 per cent:40 per cent), storage (28 per cent:43 per cent) and GRC (29 per cent:43 per cent) respectively. This joint endeavour, between boards, IT team, technology partners, customers and internal departments like networking and security, shows how closely today’s CIOs work with customers and suppliers, and the greater clout that customers now have with enterprise IT teams. The need for IT bosses to seek co-operation with colleagues and partners in understanding anything such as customer’s needs, 24/7 security monitoring across regions, and sorting out slow-running applications, has a ‘ripple effect’ across the wider survey responses. While more than half of interviewees (58 per cent) wants to manage IT in-house, we were not that surprised that more interviewees (43 per cent) run decentralised IT functions than centralised ones (35 per cent). Most revealingly, perhaps, one fifth of the survey (18 per cent) runs its corporate technology through a specific function of the organisation, like security or networking. This willingness of CIOs to hand over responsibilities to enterprise colleagues may be a simple recognition of the constant ‘do more with less’ pressure on IT bosses - or it may be an indicator of the expert skills sets residing within internal corporate functions, particularly where companies have grown rapidly by acquisition. And with such pressure to deliver customer demands, business and partner outcomes, it’s scarcely surprising that enterprise CIOs are turning to a wider range of technology partners to bring about innovation. While a majority of those that we questioned (55 per cent) turns to a global management consultancy as their key IT innovation partner, this route is only slightly more popular than using specialist technology consultants with global reach, or in-house technology units, (both 45 per cent) and regional IT partners (41 per cent). Over one third of interviewees say that their go-to IT partner is either a global non-consultancy partner or a local technology partner (both 36 per cent). Today’s CIOs are just as likely to team up with a specialist managed services provider or a regional IT expert as a global technology vendor. CIOs know that old-style ‘board-driven’ or in-house innovation models will no longer satisfy customers who are already working closely with them in extended supply chains or federated business models, giving them far more influence than before. IT bosses are increasingly having to defer to business units that are close to the customer, or to turn to third parties that can take on tasks like security or networking monitoring, to deliver better customer experiences and more agile innovation processes. However, our survey proves clearly that CIOs are taking ever-more sophisticated approaches to make innovation happen on a world-wide scale. 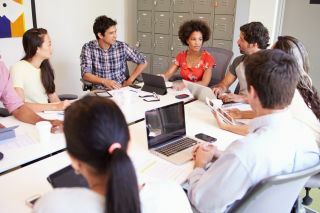 IT directors are getting a freer hand on strategy for sure but when it comes to executing plans across multiple time-zones or hundreds of corporate locations, they are frequently having to set up new types of collaborations or regularly hand over specific areas to outside experts as their in-house teams lack the skills to get the necessary results.